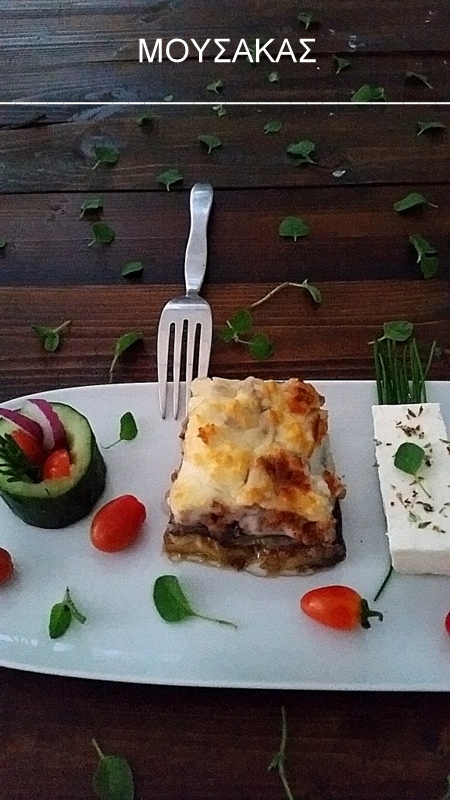 Moussaka is an eggplant– (aubergine) or potato-based dish, often including ground meat, in the cuisines of the countries of the former Ottoman Empire, with many local and regional variations.Most versions are based primarily on sautéed aubergine (eggplant) and tomato, usually with minced meat. 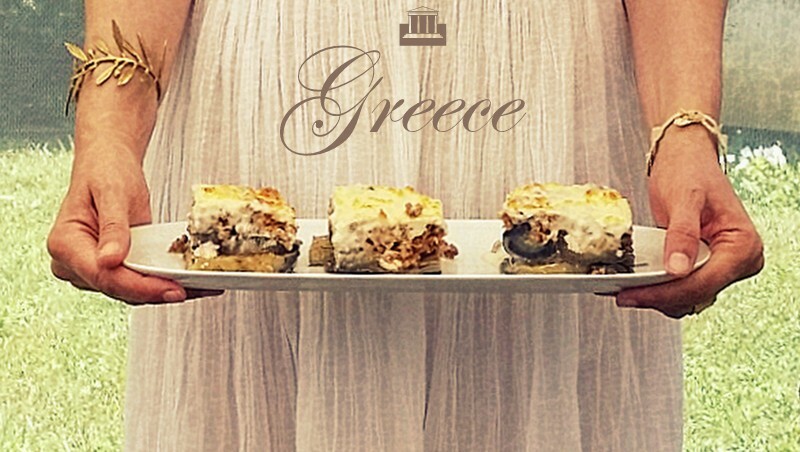 The Greek version includes layers of meat and eggplant topped with a Béchamel (“white”) sauce, and baked. 1 Heat the olive oil in a large sauté pan over medium-high heat and brown the ground meat. By the way, the meat will brown best if you don’t stir it. Add the onions about halfway into the browning process. Sprinkle salt over the meat and onions. 2 Once the meat is browned and the onions have softened, add the garlic, allspice, cinnamon, black pepper, oregano and tomato paste. Mix well and cook for 2-3 minutes. 3 Add the red wine and mix well. Bring the sauce to a simmer, reduce the heat and continue to simmer gently, uncovered for 20 minutes. Turn off the heat. Taste for salt and add more if needed. Add the lemon zest and the lemon juice. 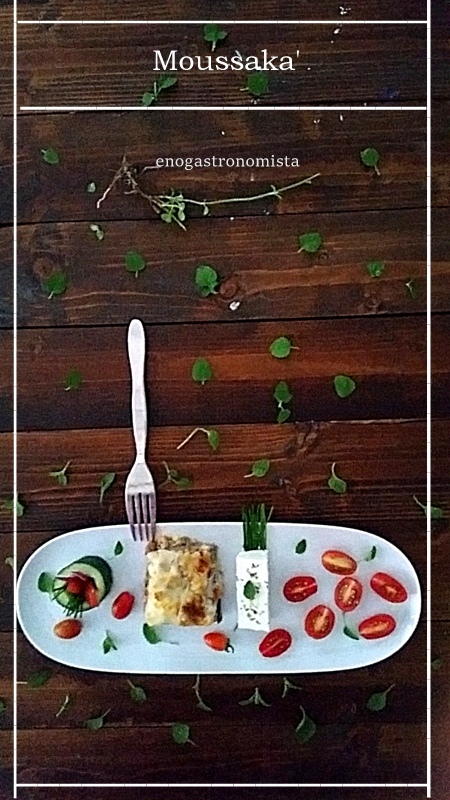 Mix well and taste. If the sauce needs more acidity, add more lemon juice. 4 Mix the 1/2 cup salt with the 8 cups of water in a large pot or container. This will be the brine for the eggplants. 5 Slice the top and bottom off the eggplants. Cut thick strips of the skin off the eggplants to give them a striped appearance. A little skin on the eggplant is good for texture, but leaving it all on makes the moussaka hard to cut later, and can add bitterness, which you don’t want. 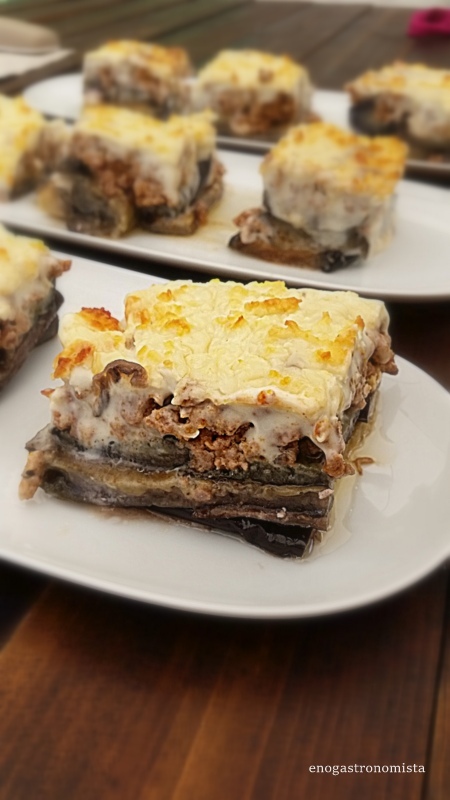 (Some moussaka recipes leave the skin on and have you slice the eggplants lengthwise, which is an option if you prefer.) Slice the eggplant into 1/4 inch rounds and drop them into the brine. 6 Let the eggplants sit in the brine 15-20 minutes, then remove them to a series of paper towels to dry. Place a paper towel down on the counter, layer some eggplant on it, then cover with another sheet of paper towel and repeat. 7 To cook the eggplant, broil or grill the rounds. You could also fry the eggplant rounds but they tend to absorb a lot of oil that way. To grill the eggplant rounds, get a grill very hot and close the lid. Paint one side of the eggplant rounds with olive oil and grill 2-3 minutes. When they are done on one side, paint the other side with oil and flip. When the eggplants are nicely grilled, set aside. 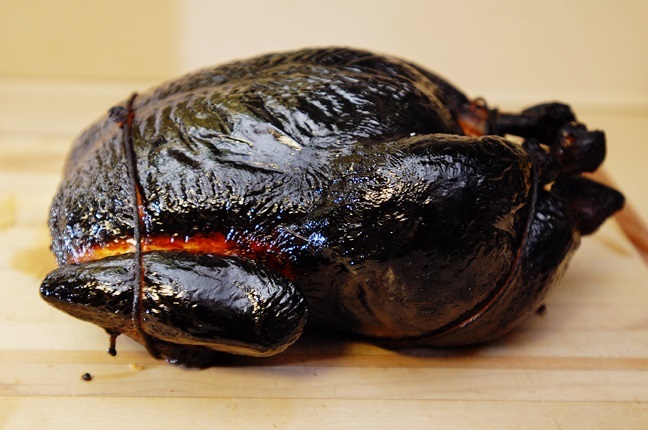 To broil, line a broiling pan or roasting pan with aluminum foil. Paint with olive oil. Place the eggplant rounds on the foil and brush with olive oil. Broil for 3-4 minutes until lightly browned on one side, then flip them over and broil for a few minutes more. Set aside. 8 Heat milk in a pot on medium heat until steamy (about 160 degrees). 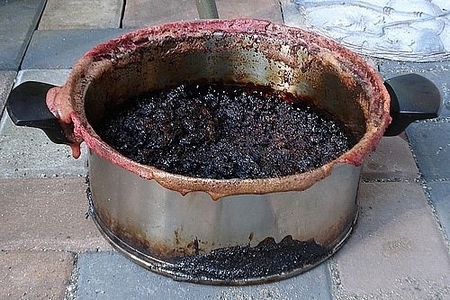 Do not let simmer. 9 Heat the butter in a small pot over medium heat. When the butter has completely melted, slowly whisk in the flour. Let this roux simmer over medium-low heat for a few minutes. Do not let it get too dark. 10 Little by little, pour in the steamy milk, stirring constantly. It will set up and thicken dramatically at first, but keep adding milk and stirring, the sauce will loosen. Return the heat to medium. Add about a teaspoon of salt and the nutmeg. Stir well. 11 Put the egg yolks in a bowl and whisk to combine. Temper the eggs so they don’t scramble when you put them into the sauce. Using two hands, one with a whisk, the other with a ladle, slowly pour in a couple ladle’s worth of the hot béchamel into the eggs, whisking all the time. Slowly pour the egg mixture back into the béchamel while whisking the mixture. Keep the sauce on very low heat, do not let simmer or boil. 12 Preheat the oven to 350°F. 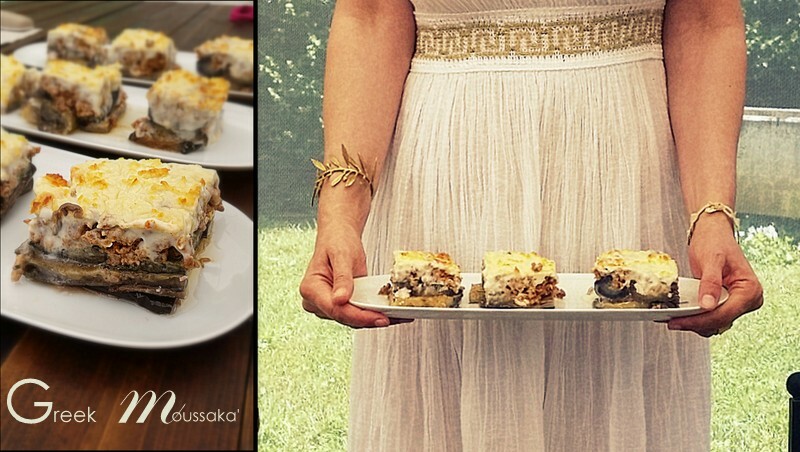 Layer a casserole with the eggplant slices (use just half of the slices). 13 Cover the eggplant slices with the meat sauce. Then layer remaining eggplant slices on top of the meat. 14 Sprinkle half the cheese on top. 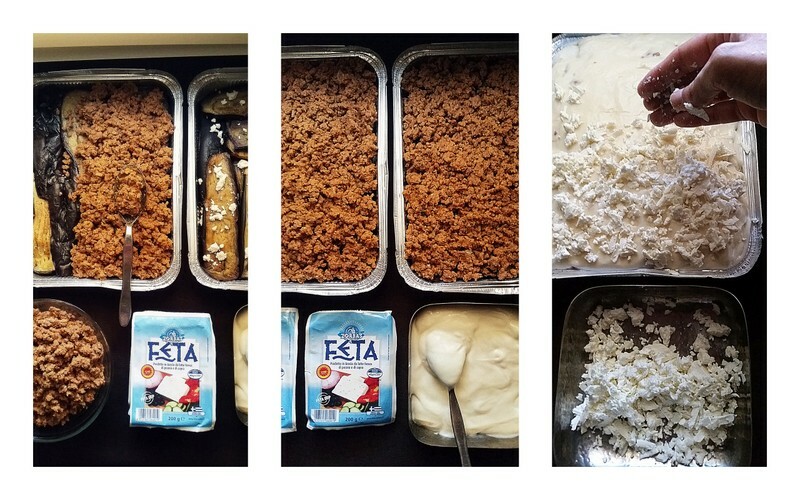 Ladle the béchamel over everything in an even layer. Sprinkle the rest of the cheese on top. 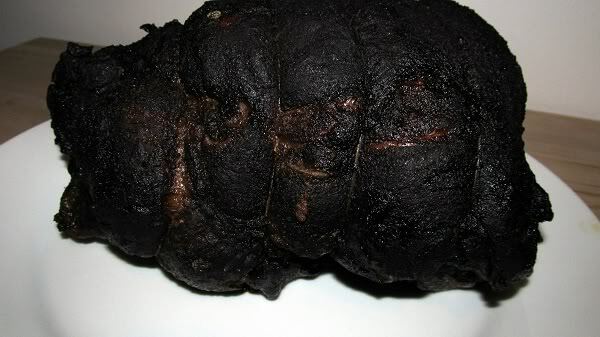 15 Bake at 350°F for 30-45 minutes, or until the top is nicely browned. 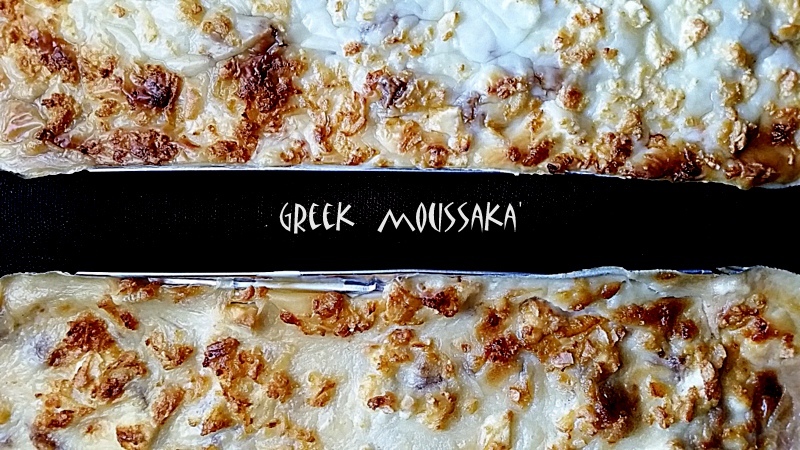 Let the moussaka cool for at least 15 minutes before serving.